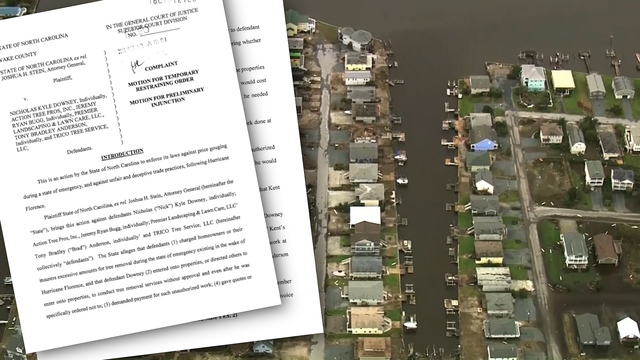 Preliminary injunctions have been granted against two western Kentucky companies accused of price gouging after Hurricane Florence in North Carolina. In the first suit, Nicholas Downey and Henderson-based Action Tree Pros will be forbidden from conducting tree removal services in North Carolina. In the second suit, Scott Lacey, Randy Shannon, and Scotts Tree Services will be prevented from doing any business in North Carolina as well. In addition, a debt collection company based in Massachusetts will be forbidden from doing any debt collection from North Carolina consumers. Downey is accused of estimating $5,000 to do tree removal work on a Wilmington-area property but instead submitting a bill for $10,585 when the work was complete. The property manager allegedly told Downey not to work on any other properties she managed, but Downey is accused of ignoring this and contracting with Premier Landscaping and Lawn Care, owned by Kentucky resident Jeremy Bugg, to perform tree removal at excessive prices. Injunctions granted against two western Kentucky businesses accused of price gouging.